Games can't get more German than this. If you're fond of little wooden cubes and cherish a certain predilection for obtaining majorities, this game is for you. I'll try to draw a rough outline of the game. I deliberately won't attempt to mention every single rule. 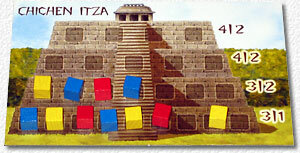 As you expect from an El Grande style game, there are two different phases: Gaining cubes and placing cubes. The gaining cube phase has the players put face down cards at different places. Those different places pay a different number for cubes for the first, the runner-up and sometimes lower scorers. Additionally, they give special abilities to the winner (like: "place one cube immediately for free" or "in the placing phase, miss one turn if you want"). As a rule of thumb, the more powerful the special abilities are, the less cubes you can earn at that place. Each player has the same set of numbered cards which are, as already said, played face-down. Contrary to games with similar mechanics ("Corruption", "Caesar und Cleopatra") which tend to be more or less luck-driven, Maya introduces two different backsides for those bid cards. This means you can see whether a player is really interested, even if you cannot know whether he played 6, 7, or 8. Or, you see that he only played 3, 4, or 5 and so he is probably satisfied with a third place. Aaron complained after the game this approach still involves too much luck. Well, yes. It's frustrating to lose a place by one point (or even the tie-breaker rule). On the other hand, games need some luck element. In any case, it's a much quicker and much less chaotic way to gain cubes than "Venezia's" built-in pigeon wargame. And I was impressed that in our 5 player game players always got 7-9 cubes (with 9 being quite rare) - this implies thorough game testing. The placing phase has some interesting new ideas, too. Most surprising perhaps is the tie rule. Imagine two players with two cubes each and three players with one cube each. In most games, the 2 players would share the victory points for the first and the second place. In Maya, both get the full number of victory points for the first player, and, even more astounding, those 3 players get all the number of victory points for the runner-up. In most games there are scoring areas which you can completely ignore. But in Maya, it is always possible to get points with just one cube. This makes the game more thrilling. All El Grande style games need a mechanism for removing cubes. In Maya, each player who scored loses a cube (so in our example, each and every player loses one cube, leaving a single cube of those two players who have two cubes each before). 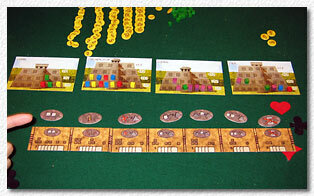 And there is another surprising element: The scoring areas are different levels in the pyramids which afford more victory points the higher up you get. All first levels have to be covered before you can place in any second level and so on. You are not allowed to put a cube in a level if there aren't any cubes of yours in every lower level of the same pyramid. This means: often, you just put one cube in a pyramid to keep your options for high levels. But woe on you if you happen to score with your single cube - remember it gets removed, and if it was indeed your last in that particular level, all cubes from higher levels are removed as well. It can be very confusing to read descriptions of games you haven't played, and this was perhaps already confusing enough. 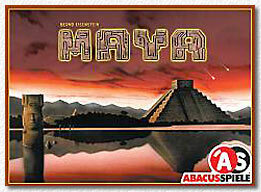 However, my main point is that Maya offers a dazzling variety of tactical choices, and I tried to convey that. Perhaps I am a little bit over enthusiastic (compare how other WPGs scored the game) but for me it is the best El Grande style game at this time.